Abstract: Trastuzumab is a monoclonal antibody that is used in the treatment of breast cancer. Trastuzumab targets the human epidermal growth factor receptor 2 (HER2) receptor on breast cancer cells that express this tyrosine kinase receptor. These cancers are referred to as HER2-positive breast cancer. The original studies of trastuzumab showed improved survival in metastatic breast cancer; however, resistance often develops. In the adjuvant setting, women often progress despite therapy that includes trastuzumab. Antibody–drug conjugates are a new class of powerful drugs designed to target high-dose chemotherapy directly to the cancer cells. Trastuzumab emtansine is one of these antibody–drug conjugates and was the first Food and Drug Administration approved drug for a solid tumor. Emtansine is a potent antimicrotubule agent. Trastuzumab is used to target this potent chemotherapy agent directly to the HER2-expressing cancer cells. This review article will summarize the evidence from the preclinical studies, summarize evidence from the clinical trials, discuss current clinical trials, discuss current approval of trastuzumab emtansine, and discuss future directions of research. The development of HER2-targeted agents has changed the treatment of HER2-positive breast cancer, leading to a dramatic improvement in the lives of women affected by this disease. Trastuzumab, a monoclonal antibody inhibiting HER2, was the first therapeutic antibody targeted at a solid tumor molecular marker to receive US Food and Drug Administration (FDA) approval.5 Trastuzumab improves overall survival (OS) in both early-stage and metastatic breast cancer (MBC); however, tumor progression after exposure to trastuzumab continues to occur.6,7 Antibody–drug conjugates (ADCs) are a new class of powerful drugs designed to target high-dose chemotherapy directly to the cancer cells. Trastuzumab emtansine (T-DM1) is one ADC that targets HER2 and has been shown to cause significant improvements in progression-free survival (PFS) in patients with prior progression on anti-HER2 agents.8,9 This article will review the history, development, and role of T-DM1 in the treatment of HER2-positive breast cancer. Dual HER2 inhibition – the administration of two anti-HER2 agents simultaneously – may lead to more durable tumor response than sequential HER2 therapy.14 Pertuzumab is a monoclonal antibody that targets the dimerization domain of HER2. When given in combination with trastuzumab, pertuzumab leads to an improvement in PFS in patients with metastatic HER2-positive breast cancer.20 Similarly, lapatinib is a tyrosine kinase inhibitor that blocks intracellular tyrosine kinase function in HER1 and HER2. Lapatinib and trastuzumab can lead to dramatic responses in patients with prior progression on trastuzumab-based therapy.21,22 ADCs may be considered a form of dual therapy as well. In the example of T-DM1, the antibody portion of the conjugate retains the anti-HER2 effects, while the chemotherapy portion of the conjugate inhibits cell division. Notes: (1) Trastuzumab retains all of its mechanisms of action. It delivers the DM1 chemotherapy directly and specifically to the HER2-positive breast cancer cell. (2) T-DM1 is internalized into the HER2-positive breast cancer cell. (3) DM1 is released once inside the cell. DM1 is a very potent chemotherapy agent that inhibits tubulin development of the mitotic spindle and cell division. Abbreviations: DM1, emtansine; HER2, human epidermal growth factor receptor 2; T-DM1, trastuzumab emtansine. DM1 is the chemotherapy agent used in T-DM1. It is a derivative of maytansine collected from plants and mosses, and primarily prevents tumor growth by inhibiting tubulin development of the mitotic spindle and cell division.31 This chemotherapeutic agent is not routinely used in oncology practices due to the side effect profile caused by a small therapeutic window, as DM1 is approximately 100 times more potent than vincristine.32,33 The linker of the antibody and cytotoxic drug is very important. If the link is too unstable, then the drug will be delivered to the blood stream and peripheral tissues. If the link is too strong, then it may not be able to be cleaved.28,34 Overall, these ADCs are very complex and often very difficult to develop. After the extensive preclinical work, Phase I clinical trials are conducted to characterize the pharmacokinetics, safety, and maximum tolerated dose (MTD) of the drug. We will discuss the Phase I clinical trials conducted in patients with advanced HER2-positive MBC. These trials are also summarized in Table 1. Based on the exciting preliminary efficacy results presented in the Phase I clinical trials, T-DM1 moved on to Phase II development. The MTD of T-DM1 (3.6 mg/kg every 3 weeks) from the 2010 published paper was selected as the recommended Phase II dose. There have been three main Phase II clinical trials published to date. These trials are also summarized in Table 2. Abbreviations: HER2, human epidermal growth factor receptor 2; MBC, metastatic breast cancer; T-DM1, trastuzumab emtansine. Given the results of the efficacy and safety of T-DM1 in MBC in the Phase II clinical trials, the Phase III clinical trials were conducted to characterize the value of T-DM1 in clinical practice. To date, there is one Phase III clinical trial with published results utilizing T-DM1. Phase III clinical trials that have completed patient accrual without public results or studies that are ongoing are listed in Table 3. Abbreviations: HER2, human epidermal growth factor receptor 2; IV, intravenous; MBC, metastatic breast cancer; N/A, not applicable; T-DM1, trastuzumab emtansine; EORTC, European Organisation for Research and Treatment of Cancer; CR, complete remission. Based on the EMILIA clinical trial, the FDA approved T-DM1 on February 22, 2013.27 It was approved for patients with HER2-positive MBC who previously received trastuzumab and a taxane (separately or in combination). Patients should have either: received prior therapy for metastatic disease, or developed disease recurrence during or within 6 months of completing adjuvant therapy.43 The trade name of T-DM1 is Kadcyla®. Kadcyla was approved with the generic name “ado-trastuzumab emtansine”. The FDA recommends that health care professionals use the FDA-approved proprietary name (Kadcyla) and its nonproprietary name (ado-trastuzumab emtansine) when communicating medication orders or in electronic order entry systems.44 This is to help reduce the potential for medication errors and confusion with trastuzumab (Herceptin). Multiple phase I–III clinical trials are currently underway investigating the use of T-DM1 in breast cancer (see Table 3). While T-DM1 is also being tested in HER2-positive gastric cancer,46,47 we will focus our summary on the six large Phase III clinical trials currently underway in patients with HER2-amplified breast cancer. These include the MARIANNE study,48 TH3RESA study,9 KATHERINE study,49 ATEMPT study,50 NCT01702571,51 and KAITLIN. Both trastuzumab and T-DM1 are large molecules and are not thought to cross the blood–brain barrier.53 It has been shown that adjuvant trastuzumab is associated with a significant increased risk of CNS metastases as the site of first recurrence in HER2-positive breast cancer patients.54 In a study of 113 women with HER2-positive MBC who had received trastuzumab-based therapy, only 8% of patients had CNS disease at first diagnosis of metastatic disease; however, 55% developed CNS disease during the course of the treatment.19 In another study, 65% of women developed CNS metastases during treatment with T-DM1.55 Also, in the Phase II study by Krop et al, six patients developed brain metastases as the first site of progression.41 There have been some case reports of brain metastases responding to T-DM1. One case report in the Journal of Neuro-Oncology reported a patient with breast cancer who had her brain metastases respond to T-DM1.56 Though, there was some concern that the patient in this case report had an impaired blood–brain barrier.56 The diagnosis of brain metastases can be catastrophic for patients and continued research is needed in this area. In conclusion, there has been significant progress in the development of target therapies for cancer in the past few decades. The development of ADCs, like T-DM1, is particularly promising. It has increased antitumor effect while at the same time improved toxicity. The preclinical and clinical trials show extreme potential for the future of T-DM1 and other ADCs that are likely to come. It is an exciting time for the oncology field and the oncologic treatment of our patients. Dr Macrae is supported by Translational Training Grant in Experimental Therapeutics 5 K12 CA133250-04. Giuliano A. Breast Disorders. In: McPhee S, Papdakis M, editors. Current Medical Diagnosis and Treatment. 48th ed. New York: McGraw-Hill; 2009:630–654. Ross JS, Slodkowska EA, Symmans WF, Pusztai L, Ravdin PM, Hortobagyi GN. 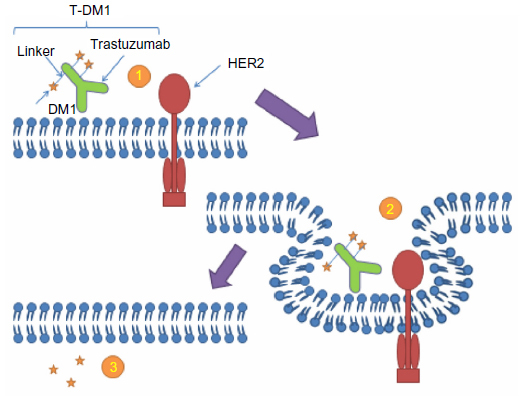 The HER-2 receptor and breast cancer: ten years of targeted anti-HER-2 therapy and personalized medicine. Oncologist. 2009;14(4):320–368. Slamon DJ, Clark GM, Wong SG, Levin WJ, Ullrich A, McGuire WL. Human breast cancer: correlation of relapse and survival with amplification of the HER-2/neu oncogene. Science. 1987;235(4785):177–182. Kumar G, Badve S. Milestones in the discovery of HER2 proto-oncogene and trastuzumab (herceptin). Connections. 2008;13:9–14. Herceptin® (trastuzumab) [prescribing information]. South San Francisco, CA: Genentech; 2014. Tripathy D, Salmon DJ, Cobleigh M, et al. Safety of treatment of metastatic breast cancer with trastuzumab beyond disease progression. J Clin Oncol. 2004;22(6):1063–1070. Verma S, Miles D, Gianni L, et al; EMILIA Study Group. Trastuzumab emtansine for HER2-positive advanced breast cancer. N Engl J Med. 2012;367(19):1783–1791. Hoffmann-La Roche. A study of trastuzumab emtansine in comparison with treatment of physician’s choice in patients with HER2-positive breast cancer who have received at least two prior regimens of HER2-directed therapy (TH3RESA). Available from: http://clinicaltrials.gov/show/NCT01419197. NLM identifier: NCT01419197. Accessed June 18, 2014. Yarden Y, Sliwkowski MX. Untangling the ErbB signalling network. Nat Rev Mol Cell Biol. 2001;2(2):127–137. Yarden Y. The EGFR family and its ligands in human cancer: signalling mechanisms and therapeutic opportunities. Eur J Cancer. 2001;37 Suppl 4:S3–S8. Hudis C. Trastuzumab – mechanism of action and use in clinical practice. N Engl J Med. 2007;357:39–51. American Cancer Society. Breast Cancer Facts and Figures 2011–2012. Atlanta: American Cancer Society; 2012. Available from: http://www.cancer.org/acs/groups/content/@epidemiologysurveilance/documents/document/acspc-030975.pdf. Accessed June 18, 2014. Olson EM. Maximizing human epidermal growth factor receptor 2 inhibition: a new oncologic paradigm in the era of targeted therapy. J Clin Oncol. 2012;30(14):1712–1714. Hudziak RM, Lewis GD, Winget M, Fendly BM, Shepard HM, Ullrich A. p185HER2 monoclonal antibody has antiproliferative effects in vitro and sensitizes human breast tumor cells to tumor necrosis factor. Mol Cell Biol. 1989;9(3):1165–1172. Carter P, Presta L, Gorman CM, et al. Humanization of an anti-p185HER2 antibody for human cancer therapy. Proc Natl Acad Sci U S A. 1992;89(10):4285–4289. US Food and Drug Administration. FDA expands use of Herceptin for early stage breast cancer after primary therapy [press release]. Silver Spring, MD: US Food and Drug Administration; November 16, 2006. Available from: http://www.fda.gov/NewsEvents/Newsroom/PressAnnouncements/2006/ucm108788.htm. Accessed April 20, 2014. Olson EM, Najita JS, Sohl J, et al. Clinical outcomes and treatment practice patterns of patients with HER2-positive metastatic breast cancer in the post-trastuzumab era. Breast. 2013;22(4):525–531. Baselga K, Cortes J, Kim SB, et al; CLEOPATRA Study Group. Pertuzumab plus trasuzumab plus docetaxel for metastatic breast cancer. N Engl J Med. 2012;366:109–119. Blackwell KL, Burstein HJ, Storniolo AM, et al. Randomized study of Lapatinib alone or in combination with trastuzumab in women with ErbB2-positive, trastuzumab-refractory metastatic breast cancer. J Clin Oncol. 2010;28(7):1124–1130. Blackwell KL, Burstein HJ, Storniolo AM, et al. Overall survival benefit with lapatinib in combination with trastuzumab for patients with human epidermal growth factor receptor 2-positive metastatic breast cancer: final results from the EGF104900 Study. J Clin Oncol. 2012;30(21):2585–2592. Bross PF, Beitz J, Chen G, et al. Approval summary: gemtuzumab ozogamicin in relapsed acute myeloid leukemia. Clin Cancer Res. 2001;7(6):1490–1496. US Food and Drug Administration. Mylotarg (gemtuzumab ozogamicin): market withdrawal [press release]. Silver Spring, MD: US Food and Drug Administration; June 21, 2010. Available from: http://www.fda.gov/Safety/MedWatch/SafetyInformation/Safety AlertsforHumanMedicalProducts/ucm216458.htm. Accessed June 9, 2013. Gopal AK, Ramchandren R, O’Connor OA, et al. Safety and efficacy of brentuximab vedotin for Hodgkin lymphoma recurring after allogeneic stem cell transplantation. Blood. 2012;120(3):560–568. Pro B, Advani R, Brice P, et al. Brentuxumab vedotin (SGN-35) in patients with relapsed or refractory systemic anaplastic large-cell lymphoma: results of a phase II study. J Clin Oncol. 2012;30(18):2190–2196. US Food and Drug Administration. FDA approves new treatment for late-stage breast cancer [Internet]. Silver Spring, MD: US Food and Drug Administration; February 22, 2013. Available from: http://www.fda.gov/newsevents/newsroom/pressannouncements/ucm340704.htm. Accessed June 10, 2013. Girish S, Gupta M, Wang B, et al. Clinical pharmacology of trastuzumab emtansine (T-DM1): an antibody-drug conjugate in development for the treatment of HER2-positive cancer. Cancer Chemother Pharmacol. 2012;69(5):1229–1240. Junttila TT1, Li G, Parsons K, Phillips GL, Sliwkowski MX. Trastuzumab-DM1 (T-DM1) retains all the mechanisms of action of trastuzumab and efficiently inhibits growth of lapatinib insensitive breast cancer. Breast Cancer Res Treat. 2011;128(2):347–356. Isakoff SJ, Baselga J. Trastuzumab-DM1: building a chemotherapy-free road in the treatment of human epidermal growth factor receptor 2-positive breast cancer. J Clin Oncol. 2011;29(4):351–354. Higashide E, Asai M, Ootsu K, et al. Ansamitocin, a group of novel maytansinoid antibiotics with antitumour properties from Nocardia. Nature. 1977;270(5639):721–722. Yu TW, Bai L, Clade D, et al. The biosynthetic gene cluster of the maytansinoid antitumor agent ansamitocin from Actinosynnema pretiosum. Proc Natl Acad Sci U S A. 2002;99(12):7968–7973. Wang L, Amphlett G, Blättler WA, Lambert JM, Zhang W. Structural characterization of the maytansinoid-monoclonal antibody immunoconjugate, hun901-dm1, by mass spectrometry. Protein Sci. 2005;14(9):2436–2446. Lewis Phillips GD, Li G, Dugger DL, et al. Targeting HER2-positive breast cancer with trastuzumab-DM1, an antibody-cytotoxic drug conjugate. Cancer Res. 2008;68(22):9280–9290. Erickson HK, Lewis Phillips GD, Leipold DD, et al. The effect of different linkers on target cell catabolism and pharmacokinetics/ pharmacodynamics of trastuzumab maytansinoid conjugates. Mol Cancer Ther. 2012;11(5):1133–1142. Barginear MF, Budman DR. Trastuzumab-DM1: a review of the novel immuno-conjugate for HER2-overexpressing breast cancer. The Open Breast Cancer Journal. 2010;1(1):25–30. Junutula JR, Flagella KM, Graham RA, et al. Engineered thio-trastuzumab-DM1 conjugate with an improved therapeutic index to target human epidermal growth factor receptor 2-positive breast cancer. Clin Cancer Res. 2010;16(19):4769–4778. Krop IE, Beeram M, Modi S, et al. Phase I study of trastuzumab-DM1, an HER2 antibody-drug conjugate, given every 3 weeks to patients with HER2-positive metastatic breast cancer. J Clin Oncol. 2010;28(16):2698–2704. Beeram M, Krop IE, Burris HA, et al. A phase 1 study of weekly dosing of trastuzumab emtansine (T-DM1) in patients with advanced human epidermal growth factor 2-positive breast cancer. Cancer. 2012;118(23):5733–5740. Burris HA 3rd, Rugo HS, Vukelja SJ, et al. Phase II study of the antibody drug conjugate trastuzumab-DM1 for the treatment of human epidermal growth factor receptor 2 (HER2) –positive breast cancer after prior HER2-directed therapy. J Clin Oncol. 2011;29(4):398–405. Krop IE, LoRusso P, Miller KD, et al. A phase II study of trastuzumab emtansine in patients with human epidermal growth factor receptor 2 –positive metastatic breast cancer who were previously treated with trastuzumab, lapatinib, an anthracycline, a taxane, and capecitabine. J Clin Oncol. 2012;30(26):3234–3241. Hurvitz SA, Dirix L, Kocsis J, et al. Phase II randomized study of trastuzumab emtansine versus trastuzumab plus docetaxel in patients with human epidermal growth factor receptor 2-positive metastatic breast cancer. J Clin Oncol. 2013;31(9):1157–1163. Kadcyla® (ado-trastuzumab emtansine) [prescribing information]. South San Francisco, CA: Genentech; 2013. US Food and Drug Administration. Safety Alert for Human Medical Products: Kadcyla (ado-trastuzumab emtansine): Drug Safety Communication – Potential Medication Errors Resulting from Name Confusion [press release]. Silver Spring, MD; US Food and Drug Administration; May 6, 2013. Available from: http://www.fda.gov/Safety/MedWatch/SafetyInformation/SafetyAlertsforHuman MedicalProducts/ucm350817.htm. Accessed June 10, 2013. Dang CT, Gianni L, Romieu G, et al. Cardiac safety in a phase II study of trastuzumab emtansine (T-DM1) following anthracycline-based chemotherapy as adjuvant or neoadjuvant therapy for early-stage HER2-positive breast cancer. J Clin Oncol. 2012;30(Suppl 15):532. Hoffmann-La Roche. A study of trastuzumab emtansine versus taxane in patients with advanced gastric cancer. Available from: http://clinicaltrials.gov/ct2/show/NCT01641939?term=t-dm1+gastric&rank=1. NLM identifier: NCT01641939. Accessed June 10, 2013. Hoffmann-La Roche. A combination study of trastuzumab emtansine and capecitabine in patients with breast cancer or gastric cancer. Available from: http://clinicaltrials.gov/ct2/show/NCT01702558?term=t-dm1+gastric&rank=2. NLM identifier: NCT01702558. Accessed June 10, 2013. Ellis PA, Barrios CH, Im Y, et al. MARIANNE: A phase III, randomized study of trastuzumab-DM1 (T-DM1) with or without pertuzumab (P) compared with trastuzumab (H) plus taxane for first-line treatment of HER2-positive, progressive, or recurrent locally advanced or metastatic breast cancer (MBC). J Clin Oncol. 2011;29(Suppl 15):TPS 102. Hoffmann-La Roche. A study of trastuzumab emtansine versus trastuzumab as adjuvant therapy in patients with HER2-positive breast cancer who have residual tumor in the breast or axillary lymph nodes following preoperative therapy (KATHERINE). Available from: http://clinicaltrials.gov/show/NCT01772472. NLM identifier: NCT01772472. Accessed June 10, 2013. Dana-Farber Cancer Institute. T-DM1 vs paclitaxel/trastuzumab for Breast (ATEMPT Trial). Available from: http://clinicaltrials.gov/show/NCT01853748. NLM identifier: NCT01853748. Accessed April 30, 2014. Hoffmann-La Roche. A study of Kadcyla (trastuzumab emtansine) in patients with HER2 positive breast cancer who have received prior anti-HER2 and chemotherapy-based treatment. Available from: http://clinicaltrials.gov/show/NCT01702571. NLM identifier: NCT01772472. Accessed June 10, 2013. Hoffmann-La Roche. A study of kadcyla (trastuzumab emtansine) plus perjeta (pertuzumab) following anthracyclines in comparison with herceptin (trastuzumab) plus perjeta and a taxane following anthracyclines as adjuvant therapy in patients with operable HER2-positive primary breast cancer. Available from: http://clinicaltrials.gov/show/NCT01966471. NLM identifier: NCT01966471. Accessed April 30, 2014. Abraham J. Trastuzumab emtansine in advanced HER2-positive breast cancer. Community Oncology. 2013;10(3):71–73. Olson EM, Abdel-Rasoul M, Maly J, Wu CS, Lin NU, Shapiro CL. Incidence and risk of central nervous system metastases as site of first recurrence in patients with HER2-positive breast cancer treated with adjuvant trastuzumab. Ann Oncol. 2013;24(6):1526–1533. Olson EM, Lin NU, DiPiro PJ, et al. Responses to subsequent anti-HER2 therapy after treatment with trastuzumab-DM1 in women with HER2-positive metastatic breast cancer. Ann Oncol. 2012;23(1):93–97. Bartsch R, Berghoff AS, Preusser M. Breast cancer brain metastases responding to primary systemic therapy with T-DM1. J Neurooncol. 2014;116(1):205–206. Tessari A, Palmieri D, Di Cosimo S. Overview of diagnostic/targeted treatment combinations in personalized medicine for breast cancer patients. Pharmgenomics Pers Med. 2013;7:1–19. Baselga J, Verma S, Ro J, et al. Relationship between tumor biomarkers (BM) and efficacy in EMILIA, a phase III study of trastuzumab emtansine (T-DM1) in HER2-positive metastatic breast cancer (MBC). Cancer Res. 2013;73(8, Supplement 1):LB-63. ClinicalTrials.gov [homepage on the Internet]. Bethesda: US National Institutes of Health; 2014 [updated April 29, 2014]. Available from: http://clinicaltrials.gov/ct2/home. Accessed April 30, 2014.